on contractual basis. Interested candidates having eligible qualifications can apply for these vacancies through online using official website of RIE, Bhubaneswar @ www.riebbs.ac.in. Online application link activates from 09/05/2017 till 22/05/2017. Last date to send receipt of online applications is 29/May/2017. RIE Recruitment selection will be based on Interview/ Vive Voce. Date of Interview will be intimated soon through E-mail/ Mobile phone. More information regarding RIE, Bhubaneswar Recruitment 2017- Eligible qualifications, Age limit, Pay bond, Application procedure and other details are given below. 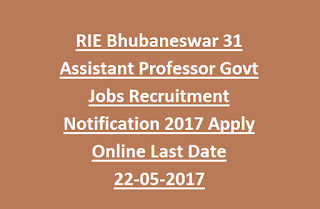 Download the Notification of Bhubaneswar RIE Recruitment 2017. Starting date for online application registrations: 09-05-2017. Closing date to submit online applications: 22-05-2017. Closing date for the receipt of online applications: 29-05-2017. Post Name: Assistant Professor- 31 posts. Selected candidates applying for RIE Assistant Professors will be paid Rs.45,000/- per month. Candidate should have good academic record with at least 55% aggregate marks in Master’s Degree in relevant subject from an Indian University or its equivalent degree from an accredited foreign university. B.Ed/ M.Ed or equivalent qualification are desirable for the post of Asst Professor. Candidate must have also cleared National Eligibility Test (NET) in relevant subject conducted by UGC, CSIR/SLET/SET. Age limit to apply for Assistant Professors is applicable as per UGC/ NCERT/ GOI Norms. RIE Recruitment selection will be based on candidate performance in Interview/ Viva Voce. Interested candidates fulfilling all eligible criteria mentioned in the notification can apply for the current recruitment through online using RIE official website @ www.riebbs.ori.nic.in. Opening date for submitting online applications is 09-05-2017. Submit the filled applications before 22-05-2017. After submission of online application, send the hard copy of application with passport size photo and relevant documents to the following address before 29-05-2017. 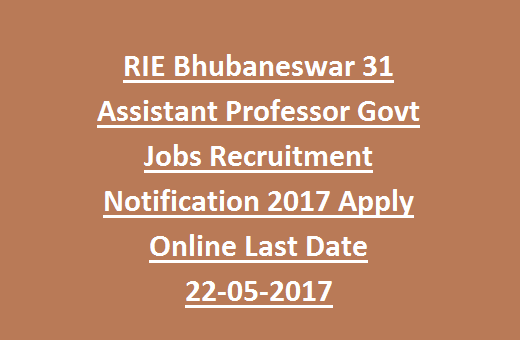 Apply online for Bhubaneswar RIE Assistant Professor Jobs Recruitment 2017. Please share this Regional Institute of Education RIE, Bhubaneswar Recruitment Examination 2017 article to your friends.